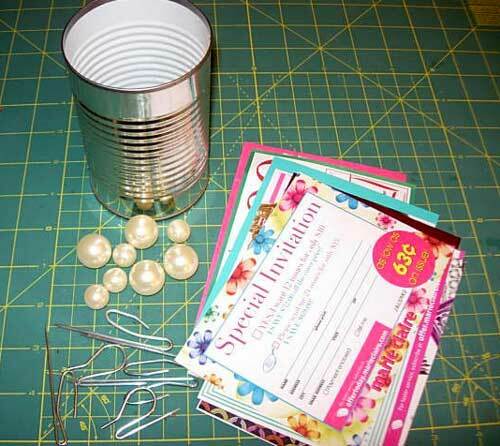 What can you do with a soup can, curtain hooks, those pesky advertising inserts from magazines, and a few beads? You will soon find out. I call it my Trash to Treasure Tin Can. This is my attempt at creating a “Blah-to-TADA” post. Look back at the photo above to see my trash to treasure tin can. Cut advertising insert to the height of the can. 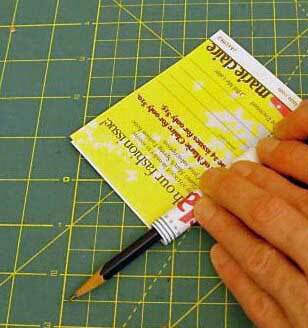 Roll tightly around a pencil and hot glue edge down. Remove pencil. Make a bunch so you have a pile like this. 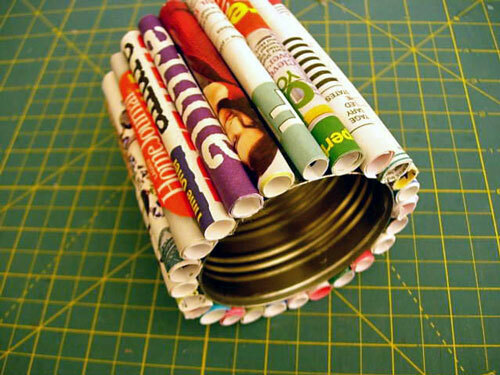 Put a line of hot glue on the seam edge of each rolled tube and attach to the can, making sure to keep each roll straight. 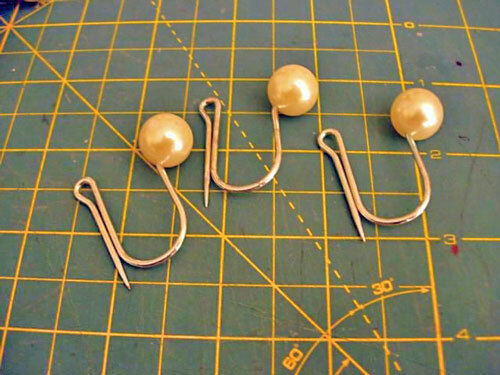 Put a bead on each curtain hook. 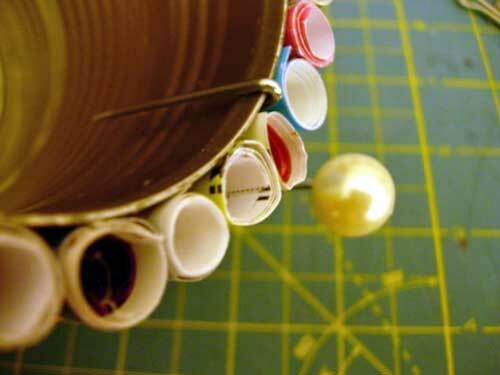 Push each hook between two tubes along the top edge of the can. I also hot glued big beads to the bottom as decorative feet. For the bigger can I used an old calendar to make the tubes. For more DIY Organizing tips check out my Organization Gallery. 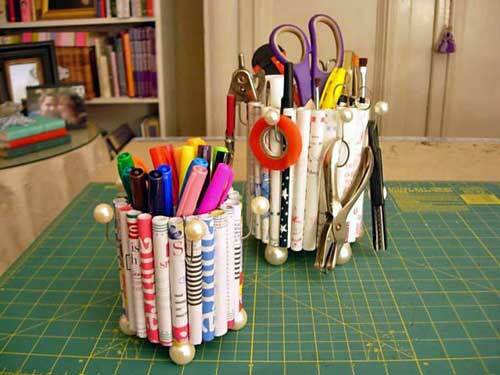 I love this, such a great repurposing idea! Cool. Clearly I’d want you in my blog tribe! Very cool! Thanks for stopping by my blog, glad to meet you! Love your catch all so much! I love it! I especially love how you used those pesky inserts. Soooo cute. That is great! I love it! Who would think you could do that with inserts? Those are just great! I love finding ways to repurpose things. Fun post and great blog. Thanks for visiting me today. FANTASTIC!!! They look so cool!! That is awesome! I use tons of cans for each of my 4 kiddies things. This is going to be our weekend project. Thank you so much for sharing. (p.s.) Stopping by from SITS! Who would have thunk it. Fun project. Totally great!! I love green crafts…I make them too. Very creative. How do you come up with it??? Very, very cute! My favorite part of this project is that you can hang things on the hooks- making things easy to find and reach. ooooh, I like this. I love how you can hang the scissors and stuff on the side hooks too! Hi Megan – My mom was very creative and always coming up with clever ideas when I was growing up. I remember going to crafts shows and church bazzaars with her all the time to see what people had made. It fascinated me and still does. Coming up with ideas is is just how my brain is wired. Hi Diane! I LOVE your blog :) Thanks for featuring me on your blog…I’m honored(blush)! This project is totally TADA! Happy crafting! Oh, these are fantastic! I am always looking for cute (nearly free!) storage ideas!!! Pure genious! 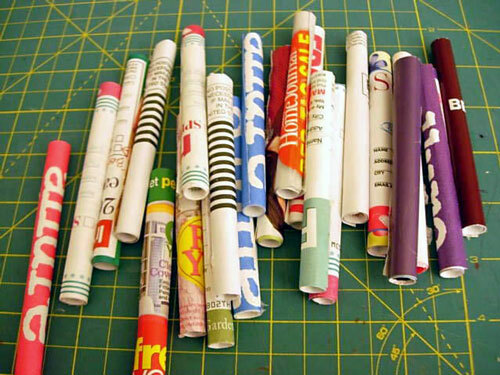 it’s like your on Survivor …for crafters! SHUT. UP.!!!!!!!!!!! I loooooooove that!!!!!! Come check out my blog today! This is so cool! I would have never thought of it. How cute is that? !